My love for horses started at a very young age and growing up with these magnificent animals, I could always picture myself working with horses one day. However I could never decide what I was going to do. As I became older and participated in more horse shows, I noticed that many horses had severe bit-problems (meaning any problem involving the horses mouth and the bridle bit) which trainers could not seem to solve with bit changing and adjusted training methods. Only when my own competition horse started showing signs of a bit-problem, I understood the frustration of fellow competitors and horsemen dealing with similar problems. My horse’s bit-problem started to affect his condition and performance. Fortunately one day at a show, I met a lady who noticed my problem. She identified herself as an Equine Dental Technician (EqDT) and asked if she could have a look at my horse’s teeth. 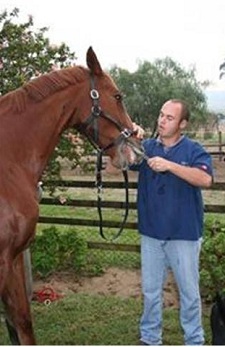 At first I was sceptical as I had never linked his bitting problem to his teeth, let alone heard of an Equine Dental Technician before, but I knew that I needed to help my horse therefore I was prepared to try something new. After she had opened his mouth with her speculum she quickly identified the problem. A large overgrown back molarhook (aka caudal hook) penetrated his gum line which was extremely painful making it difficult for him to accept the bit. We immediately scheduled an appointment, and I was astonished with the end result. Soon after his teeth were floated and the molar hook was floated to its normal size, the improvement in my horse was unbelievable. Three months later he did not show any trace of a previous bit-problem and he started to maintain his weight in such a way that I could practically halve his feeding ration within the next six months. After this experience I realised how important it is for horse owners to schedule regular dental check-ups for their horses from an early age as such a dental appointment would have identified and eliminated above mentioned problem before it became serious. It also became evident to me that there was a great need for Equine Dental Technicians in the country, as many horses needed their professional help. 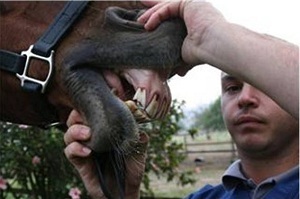 Finally I knew what I wanted to do: ‘I was going to become an Equine Dental Technician’. This was no easy task as there is no formal training in South Africa for this specialised profession. I had to study overseas which I could not afford at that time. After years of working as a stud manager, I was able to provide enough funding to study at The American School of Equine Dentistry in Florida, USA. After graduating in 2007, I finally fulfilled my dream and started my career as an Equine Dental Technician. To have a better understanding of your horse’s mouth and surrounding structures, I will give a brief explanation of a horse’s dental anatomy and tooth eruption followed by a short description of the most common dental problems and subsequent dental procedures. I will end of with listing the most important symptoms which can help you as horse owner to identify a dental problem. 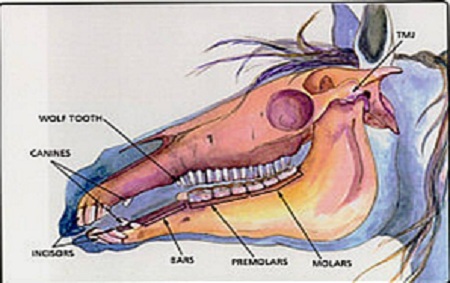 A foal is born with only 12 premolars, 3 on each arcade (arcade meaning row of teeth). They also have 4 central incisors one on each arcade (note some foals are born without incisors, only erupting a few days after birth). After 6 weeks a foal will erupt 4 more lateral incisors and 6 months after birth, another 4 corner incisors will erupt. Note all the abovementioned teeth are deciduous (milk) teeth. Before the age of 5 a young horse will have 24 deciduous (milk) teeth, which will all start shedding from the age of 2 ½. All of the deciduous teeth should be completely shed approximately by the age of 5 years. At the same time 12 extra permanent molars will also erupt. From the age of 5 years, the adult gelding or stallion will have between 40 and 42 permanent teeth depending if the horse has wolf teeth. Mares usually only have between 36 and 38 permanent teeth, depending again on the presence of wolf teeth. It is interesting to note that some mares can erupt small canines sometimes hidden beneath the gum lining. However, this is very rare. Six incisors for cutting of grass, leaves ect. Four canines are found in stallions and gelding which erupt between four and five years of age. These canines are used to protect and defend the herd. Occasionally two wolf teeth are found just in front of the upper pre molars. These teeth are believed to be remains from the evolution of the horse and have no present day function. Continuing towards the back of the mouth we find the cheek teeth, consisting of twelve premolars, three on each arcade. Behind them we will find twelve molars, also three on each arcade. Their function is to break down and grind food particles releasing all of its valuable nutrition. Horses graze most of the day resulting in strenuous ware on the teeth therefore a horse’s teeth continually erupt during its lifetime to keep up with every day grinding. The teeth of a young horse erupt at a faster rate (before 15 years there is an eruption of +-3mm per year), and slows down as the horse becomes older (after 15years there is only an eruption of +-1mm per year). Some very old horses (plus 20 years) have completely erupted reserve crown (reserve tooth underneath gume), therefore the tooth will be shed. In nature the wild horse’s teeth will maintain itself at a constant size and sharpness due to exposure to a greater variety of course food. With the domestication of wild horses we started feeding them softer and easy palatable feed, together with shorter grazing hours we basically created a range of dental problems. Most common dental problems found in horses. Sharp enamel edges This is the most common problem found in domesticated horses. The inner and outer edges of the cheek teeth do not wear properly due to masticating soft feed resulting in razor sharp enamel points. This is found on the outside of the upper cheek teeth and on the inside of the lower cheek teeth and can cause ulceration leading to infection, abscess ect. This is usually prevented by having the sharp edges floated every 6 months. Rostral and caudal hooks This can be caused by the abnormal conformation of the mouth (e.g. overbite) or as result of an abnormal eating position (e.g. too high hay nett). This problem can be solved by the hooks being floated to their normal size using either motorized burrs or manual floats, depending on the severity. Overpowering molars (wave, wedge, stepmouth, ramp, diastema). These are most common in older horses (20+) as a result of cheek teeth losing their density. These teeth can either break, perish or completely erupt due to no reserve crown. This will result in the opposite tooth continually erupting as it has no opposite tooth surface to wear down against, finally resulting in the tooth penetrating the soft tissue and surrounding area causing severe pain. This will also prevent the jaw from moving side to side freely causing difficulty with eating and digesting feed. By keeping such overpowering teeth level and balancing the mouth, the horse will be able to continue grazing without any discomfort. Wolf teeth sensitivity-Wolf teeth are small premolar teeth usually positioned on the upper jaw just in front of the 2nd premolars. They vary in size and can be as small as 5mm in length. Due to the fact that a wolf tooth have a small root system, the tooth can become loose and pinch the nerve endings near the root while the horse is being ridden causing severe pain. This can sometimes result in the horse tossing its head or even rearing when rein contact is taken. Usually these teeth need to be extracted to avoid discomfort and to prevent bad habits during training. All the above mentioned problems need to be addressed by an Equine dental technician or veterinarian to prevent weight loss, stomach ulcers, colic, bad skin condition, oral infections or abscessing and bit resistance to name a few. It is a good rule of thumb to have your horse checked by an Equine dental technician or veterinarian every 6 months. Oral inspections usually take up to 20 minutes and is necessary to identify any problems before it starts affecting the horse. Firstly a complete examination of the head and surrounding structures will be done. Next a full mouth speculum will be inserted on the incisors to keep the mouth open. The mouth will then be flushed to remove all food particles and by the use of a headlamp, a full oral inspection is possible. The speculum is also used to keep the mouth open whilst floating in later stages. If floating (rasping) is necessary, it will either be carried out by using hand floats or motorised equipment. The latter is used for more specialised attention. After all the necessary work has been completed, the mouth will be flushed again using clean water followed by the mouth balance being checked. All the above mentioned procedures will usually take up to 40 minutes depending on how much work needs to be done and how willing the horse is to stand still. Please note some horses do require sedation by a vet. Here are some tips for horse owners to identify possible dental problems. Any abnormal fluid protruding from the nasal passages. Hierdie boek is ook in Afrikaans beskikbaar.